"An inspiration", "world class" and "player of the year". After scoring two goals in the victory over West Ham on Monday, it is no wonder Tottenham manager Andre Villas-Boas talks about his standout performer Gareth Bale in such glowing terms. The Welshman has risen to new heights this season with several stunning goals, big-match winners and breath-taking displays. So much so he is now heavily linked with moves to the likes of Barcelona and Real Madrid, with transfer fees of more than £50m mooted. But life has not always been so rosy for the 23-year-old, who was once seen as a jinx at Tottenham and even reportedly linked with a £3m move to Birmingham City. Here is a look at the rise of the Cardiff-born attacker. Bale was spotted by Southampton scout Rod Ruddick at the age of nine playing in a five-a-side tournament for his local club, Cardiff Civil Service. April 2006: Makes Southampton debut v Millwall aged 16. He started training at the club's satellite academy in Bath but travelled to Southampton at 14 for more intensive training. At that age, he could run the 100m in 11.4 seconds. A year later, the south coast club contemplated releasing him as they were worried he would not grow enough to make it in professional football. But a growth spurt allayed those fears and he made his debut as a left-back in the 2-0 win against Millwall on 17 April, 2006. Aged just 16 years and 275 days, he became the second-youngest player to turn out for the club's first team. Southampton rejected a bid of £10m for Bale, believed to be from Manchester United, in January 2007, with George Burley, manager of Saints at the time, asking if that money was "for his left foot or right foot?". 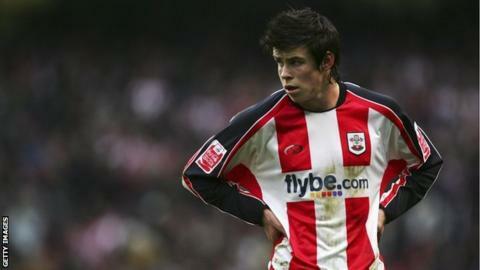 Bale was then named Football League Young Player of the Year in March 2007, finishing the season with five goals from 45 games. Having moved to Tottenham as a left-back for a fee that could potentially rise to £10m, big things were expected of Bale at White Hart Lane. But, amazingly, the Premier League side failed to register a win in his first 24 appearances, leading some journalists to question whether Spurs manager Harry Redknapp was right to select him. The Sun's Pat Sheehan covered Tottenham's 1-0 defeat by Everton on 30 November, 2008. He wrote: "One glance at the score and any Spurs fan will tell you without looking at the line-up that Gareth Bale must have played." A foot injury and a knee ligament problem also hampered Bale's development, keeping him sidelined for a large part of his first two years at White Hart Lane. The Daily Mail even linked Bale with a £3m move to Birmingham. Bale was still not sure of his best position, having arrived as a defender but showing potential going forward. Redknapp believed he should remain at the back, saying in December 2009: "I'm not looking for a left-back because you won't get a better one than Gareth Bale." After undergoing knee surgery in June 2009, Bale broke his hoodoo in his first game back by playing as a left-back in a 5-0 defeat of Burnley. He has everything to be a top player. He has to learn how to defend, learn how not to let people play balls inside him, learn to recover, just learn parts of his game. But it's all there. Within months, rumours of a bid from Manchester United began to surface, although Redknapp quickly dismissed the notion of selling the Welshman. "His game has gone up so many levels this season," said Redknapp. "He's got stronger, he's a fantastic athlete, great ability. He can do everything." Bale made 18 starts that season, scoring three goals. He then played a starring role in Tottenham's Champions League campaign the following season, after stepping into a new left-sided midfield role. His hat-trick against Inter Milan in October 2010 confirmed his status as one of Europe's top stars. Bale's goals in the 3-2 win over West Ham took his tally to eight goals in his last six games and he is now widely regarded as one of the Premier League's top performers. Manchester United's Robin van Persie and Liverpool's Luis Suarez lead the scoring charts in the Premier League on 19 and 18 goals respectively but Bale, not a striker like his counterparts, is not far behind on 15. Two of those goals have come from direct free-kicks. The Tottenham player has had more shots on target - 51 - than both Van Persie and Suarez, while his shooting accuracy of 57% betters both the Dutchman and Uruguayan. Bale has a chance conversion rate of 17% but has only notched one assist in the league so far this term. The Welshman has made 791 passes with a success rate of 78%, while he has completed 45% of his dribbles and runs this term. How good can he be? There are many experts who believe that Bale can now be mentioned in the same breath as the world's two leading stars, Lionel Messi and Cristiano Ronaldo. "Certainly Gareth Bale is up there amongst them," former Spurs defender Gary Mabbutt told BBC Radio 5 live. "With the performances he is putting in, he has to be judged as one of the best in the world at the moment. He's scored eight goals in our last six games and all of the goals have been top quality." One criticism of Bale is that he is prone to diving. He denies he is a cheat and his advocates insist he only goes to ground to protect himself from challenges. Ronaldo was dubbed a diver in his formative years at Manchester United but his brilliance took the focus off it. Bookies now rate the chances of Bale joining Ronaldo at Real Madrid as short as evens. Former Tottenham great Ricky Villa believes Bale is good enough to hold his own in such exalted company. "You have to compare him with Messi or Ronaldo, players of that quality," said the Argentine. In the past, Spurs fans dreaded seeing Bale's name on the team-sheet. Now they dread the thought of not seeing it on there.